Updated 3/19: I forgot to tell you about my article that was published last week on Natural Parents Network, 5 Lessons My Kids Taught Me. If there's one positive that comes out of being plunged in cold weather for so long, it's that I'm motivated to try new indoor activities to clear out the doldrums. For the kids, this means new art projects like shamrock potato stamps. For us, this means new food and drinks to brighten our dreary days. This week I spotted a big bunch of Meyer lemons--my first ever!--at the seconds table of our local farm stand, so I made bubbly marmalade and lemon syrup. I've been stirring the marmalade into my oatmeal and yogurt, and we tried out a new cocktail (recipe below) that received our highest rating: restaurant-worthy. On my first sip I decided it's the perfect balance between a feminine and masculine drink, a little sweet but with a punch. Last week I mentioned it was World Food Day. Today we're celebrating a nationwide Food Day, with a particular focus on helping children cook real food. Spread the word! The more we can get the conversation started about real, local, sustainable food, the better. In honor of the occasion, today I'm putting up (canning & freezing) a bounty of soups, chutneys, and jams with the season's harvest. I'm also sharing my three year old's favorite recipe for pickled red cabbage. This recipe originally came from The Joy of Pickling, but I've modified it to make it my own. I love having the blog to document all of my quirky home recipes, but I only share the adaptations that I think make the recipe better. Otherwise I just link to or cite the original source. I enjoy our summer lazy routine where we let the girls watch more TV and eat more ice cream, but there's also a quiet bliss to our back-to-school fall routine. We begin spending more hours indoors, whether in school or in our living room, and our busier schedule makes those rarer family trips outdoors to pick apples or play t-ball all the sweeter. With school fully ramped back up, I am getting back into the swing of family dinner. I admit to struggling a bit at times, continuing to serve the girls summer staples of deviled eggs or tuna salad before Nate and I have our own dinner hours later. And pretty please don't ask me whether they've been eating lots of snacks. We've had our successes too. On Sunday, for example, we went out to pick apples and filled our bellies to the brim with fruit, so we weren't as interested in a full dinner that night. Instead, the girls played happily in the next room while we chopped and simmered apples close by in the kitchen. They loved to sample a bit of still-cooking, piping hot applesauce, and Daddy whipped them up a quick grilled cheese sandwich and mug of tomato soup while we were still mixing and canning apple creations. Charlie's favorite part was the bluegrass band playing at the farmstand. Girl after her mama's heart. We've all heard in recent months about the importance of sitting down to dinner as a family. Lately I've been pondering the definition of "family dinner" and wondering if there's more room to bend the rules a bit. I'm happy to be working with The Family Dinner Project (FDP) to experiment with my neighborhood pals and see if we can make family dinners better together. They have some fantastic ways to fit in food, fun, and conversation with your children into your day. On apple-picking day, we didn't all sit together at one time to share a big spread of food; however, we did connect as a family in picking and putting away a bounty of fall's delicious harvest together. Later on in the evening at bedtime, we played a game FDP calls Rose & Thorn, asking them what their favorite and least favorite parts of the day were and sharing our own. If you are interested in making family dinner better in your household, I encourage you to check out the FDP website. They have so many wonderful (and free!) resources. 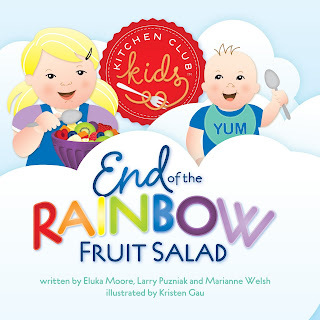 I'm also happy to be offering a giveaway today of two books that have helped us keep the kids interested in trying and eating new and different foods, which is one of the important pieces in the family dinner puzzle. Thanks to their generous publishers for making it possible to share these books! 1. 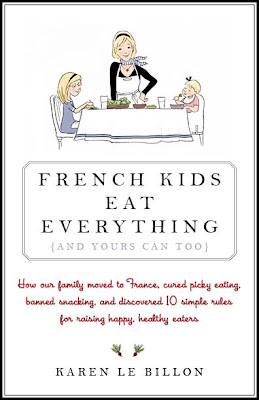 French Kids Eat Everything. I wrote about this book in April, and the post was syndicated on BlogHer. A publicity manager of the publisher, HarperCollins, found what I wrote and offered to share the book with two readers of this blog. 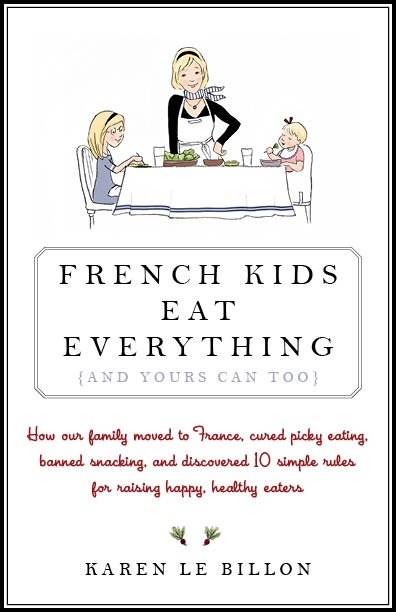 I absolutely loved this book; it changed the way we eat dinner forever, and it has made the experience so much more pleasant. See more of what I wrote here. 2. End of the Rainbow Fruit Salad. Here's what I wrote about it in July. The publisher offered to give y'all one of these books as well, so sign up below if you're interested! My kids love this one and still to this day call it the pickle book because of the illustrated pickle who helps make the salad. Use Rafflecopter below for your chance to win! It's that easy. Just submit a comment or drop me a line by email or Facebook if you're having trouble figuring it out. Good luck! If you've moved on from the basic stuff and want your rhubarb life spiced up, check out Marisa's (of Food in Jars) rhubarb round-up. I'll never forget my first lesson in conserving water. I was at summer camp, and our head counselor stood in front of the group and explained how we could use less water when brushing our teeth by turning off the water when not using it. As an adult who has been doing this practice most my life, it seems so elementary as to require no explanation, but I remember feeling astonished at this news as a child. Oh, right, I don't need to run the water when I'm not using it! This year is roaring by at top speed; I daresay it's the fastet-moving year of my life, and the omniscient they say that life only starts moving more quickly the older you get. Sheesh. I love that this blog gives me a chance to document all that happens around here, as these days I can't be relied on to remember it all, and I suspect (ala the wisdom and wit of Nora Ephron) that my memory will only get worse too. While conducting my mid-year time-flying assessment, it occurred to me how long it's been since I updated y'all on my Urban Farm Handbook challenge. Not since March?! Whoa baby. I'm beginning with the above affirmation, both because it's the message I want you to walk away from this post with and because I am adopting it as a new mantra after my less-than-easy first experience. But I'm getting ahead of myself. As part of my Urban Farm Handbook challenge, I made it a goal to make yogurt (in keeping with the dairy theme of March) by the end of the month. It was a modest goal considering all I technically needed to take on the task was...leftover yogurt with active cultures and milk. Seriously, that's all. I say 'technically' because I knew there a few other items that would make the experience more user-friendly, so I opted to grab some canning jars and a jar-extractor-thingy from my favorite local hardware store.